While reading an article in the Sun Sentinel we came across a mention of an art-friendly building going up in NYC. 650 Sixth Ave., a seven-story building with an art gallery on the ground floor that feature new artwork on a monthly basis. 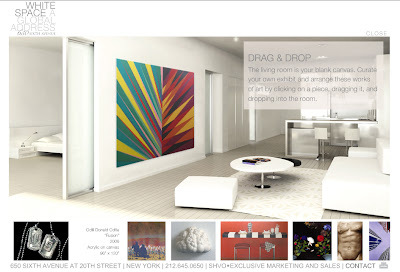 If you go to their website you can drag a painting from room to room to see where it would look best. Conceived by Michael Shvo, the innovative builder and marketer, this building is set to be one of a kind. 3Dwalkthroughs.com is a big fan of the marketing techniques of Michael Shvo and would love to introduce him to our Custom 3D Walkthroughs and 3D Floor Plans for his future developments. E-mail Print Single page view Reprints Reader feedback text size: NEW YORK It used to be that a full-service apartment building in New York meant a doorman, a roof garden, maybe a gym. These days, the can-you-top-this amenities include chic screening rooms; covered dog runs; golf simulators where you can practice your swing in front of a screen; wine cellars; bocce courts; rooftop beaches with sand and hammocks; and your own personal “art concierge” to dispense advice on what to hang on your walls. With Manhattan’s luxury real estate market awash in money from rich foreigners and Wall Street investment bankers with big bonuses to spend, developers are competing hard to attract tenants. At William Beaver House, a 47-story tower under construction in lower Manhattan, developer Andre Balazs — the hotelier and sometime Uma Thurman boyfriend — has promised valet parking, a covered dog run and a cinema with purple-upholstered lounging areas for recumbent movie viewing. Apartments there range from $900,000 for a studio to $2.6 million for a three-bedroom. Nearby, at a building called 75 Wall Street, maids from the hotel on the lower floors will be available to make tenants’ beds. On the 42nd-floor rooftop, there will be a solarium, lounge, sandy beach, hot tub, hammocks, grills and a lounging area with a fireplace and a kitchen. The couple — he’s a lawyer, she’s a doctor — selected a spacious one-bedroom condo at 650 Sixth Ave., a seven-story building with an art gallery on the ground floor. While they were at it, they picked up a $35,000 painting of diamond-studded dog tags by Israeli artist Nir Hod to put in it. The Stewarts’ 67-unit building is a gut renovation of an 1892 Beaux Arts structure in the historic shopping district known as Ladies Mile. Apartments start at $930,000 for a studio. One-bedrooms are around $1.3 million and two-bedrooms start at $1.6 million. “Month after month you’re going to be able to walk through the lobby and see something new on the wall. And if you see something you like you can buy it,” said real estate marketer Michael Shvo, who was hired to conceive the project. The gallery will also offer art collecting advice to residents. And the building’s Web site lets you drag a painting from room to room to see where it would look best. Two friends of 3DWalkthroughs.com have announced that they will be working together on the Nassau Coliseum Redevelopment Project (The Lighthouse Project). RexCorp Realty (Scott Rechler) officially hired the Spector Group (Marc Spector) as one of two master planning/architect firms that will be spearheading the project. The mixed use development project will include: an 18,000-seat arena for sporting events and concerts, housing, office space, retail stores, a hotel and a complete restoration and renovation of the Nassau Coliseum. 3DWalkthroughs.com will be closely following the progress of the Lighthouse Project as it is one of the largest and most ambitious development projects to ever happen in Long Island…not to mention two of our best friends are involved. Below is a blurb from Sunday’s NY Times describing the partnership. Go to Complete Coverage » The Nassau Coliseum redevelopment plan advanced another step when the project’s partners chose a master planning team of two architecture and planning firms, the Development Design Group of Baltimore and the Spector Group of North Hills. The two companies will design a $2 billion suburban center on 77 acres of county-owned property. It is scheduled to include an 18,000-seat arena for sporting events and concerts as well as housing, office space, retail stores, a hotel and a complete restoration and renovation of the Nassau Coliseum. The project’s partners — Lighthouse Development Group, a joint venture between Charles B. Wang, owner of the New York Islanders and founder of Computer Associates, and Scott H. Rechler, chairman of RexCorp Realty — announced the hiring of the planning team on July 20. The Development Design Group is known for malls and mixed-use developments throughout the country. The Spector Group’s projects include RexCorp Plaza in Uniondale, Jericho Plaza and the Islandia headquarters of Computer Associates. The company will provide local expertise for the project’s planning and design, said Marc B. Spector, one of the company’s principals. The Lighthouse Project is expected to create 16,000 construction jobs, as well as thousands of permanent jobs and many new businesses, and to generate almost $60 million of annual real estate tax revenue, Mr. Rechler said. An interesting article in the Economic Times exposes the migration of real estate shoppers from newspapers to the internet. With the amount of innovative applications available online focused on providing the most intimate details of a property it is no wonder the internet is eclipsing a static newspaper as a way of shopping for real estate. 3Dwalkthroughs.com believes that newspapers will have to focus heavily on creating an online presence that works synergistically with their print format if they are going to make a comeback. Tools such as 3D Walkthroughs and Interactive Floor Plans will obviously not work in a newspaper, but the newspaper can be used to highlight a property that contains these marketing tools on a listing. NEW YORK: It’s bad enough that a cratering housing market is leading to a slump in real estate advertising at newspapers, as a dreary series of earnings reports showed this week. What’s worse is that a lot of that advertising may never come back to newspapers even if the real estate sector recovers. That’s because a significant chunk of those advertising dollars are moving — you guessed, online. Exactly how much of a shift is occurring is difficult to measure in terms of dollars or market share, but several real estate executives say they are making a conscious decision to move money out of newspapers and onto the Internet as that medium grows in importance as a tool for researching home-buying decisions. Granted, a significant amount of the declines in real estate advertising in newspapers can be attributed to the general weakness in real estate markets, particularly in hard-hit markets such as California and Florida, which were booming a year ago — leading to big gains in advertising back then. This week Tribune Co, the No. 2 publisher by circulation, posted a 24 percent drop in the second quarter, while industry leader Gannett Co has reported a 9.9 per cent decline and McClatchy Co reported a 19 per cent decline, citing big losses in California and Florida. Like the housing market itself, much of the up-and-down movement in newspaper real estate advertising can be viewed as cyclical, meaning it will be weak in down markets and bounce back in the upward part of the cycle, whenever that comes up. But what’s worrying analysts this time around is that real estate could become the next category of classified advertising — after help-wanted ads — to mark a significant and permanent shift away onto the Internet. The stakes are big for newspapers since classifieds are highly lucrative and make up more than 35 per cent of their revenues. Mike Simonton, the top media industry analyst at the Fitch Ratings credit analysis service, says that currently a good 30 per cent of help-wanted classified advertising is now online, while the Internet’s share of real estate and auto classified advertising is lower, at about 15 to 20 per cent, but poised to move higher. Representatives of several major real estate franchisors said in interviews that many home sellers still see newspaper advertising as an essential component of selling a home, but that younger brokers, home sellers and buyers are clearly more focused on using the Internet. Suzy Antal, director of marketing, communications and public relations for Prudential Real Estate Affiliates, a unit of Prudential Financial Inc., said many Prudential agents have been pulling back on advertising during the current downturn, but as they return, they’re shifting ad budgets to their own Web sites, creating blogs, and taking different approaches beyond newspapers. Newspaper publishers understand they need to move more aggressively to hold on to real estate advertising. “We can’t sit on our hands,” says Charlie Diederich, the director of marketing and advertising at the Newspaper Association of America, an industry group. Diederich said newspapers are still a key part of most people’s real estate searches and an important tool for realtors to make people aware of their brands. But he also acknowledged that newspapers need to do more to make their own Web sites essential to home buying decisions. “We’ve got to improve both our print but especially our online products … so consumers will continue to come to us first so we can deliver that audience to the professional realtor,” Diederich said. A group of five major newspaper publishers also owns Classified Ventures, a Chicago-based business that powers the real estate sections of the Web sites of its 125 member newspapers. Tim Fagan, president of that group’s real estate division, said Classified Ventures would “significantly increase” its investment in Homescape, a real estate-related Web site that provides home listings, but he declined to provide specific numbers. Whether those efforts will be enough to stanch the flow of real estate ad dollars to online alternatives remains to be seen. Blanche Evans, the editor of Realty Times, an online real estate news service, says that realtors now have a number of alternatives besides newspapers for listing homes for sale, such as Realtor.org, a site run by the National Association of Realtors, in addition to major online destinations such as Yahoo Inc.
As home-buyers flock online, it’s also tough on realtors, Evans said, since home-buyers are becoming accustomed to seeing extensive color photos, descriptions of the neighborhood as well as video tours of the property — all of which costs money to produce. You are currently browsing the 3D Walkthroughs blog archives for July, 2007.